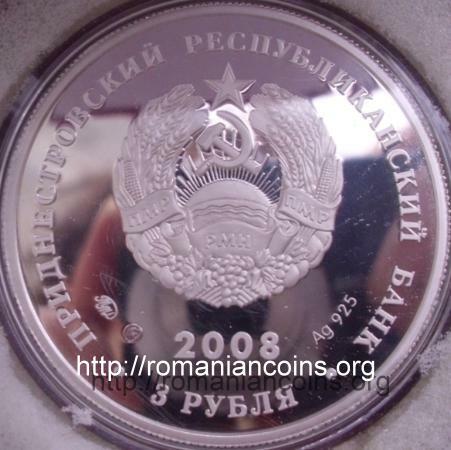 Obverse: denomination "3 RUBLIA" (Cyrillic), coat of arms of the self proclaimed republic of Transnistria (bearing hammer and sickle), inscription "PRIDNESTROVSKII RESPUBLIKANSKII BANK" (in Cyrillic and Russian) meaning "[TRANS] NISTRIAN REPUBLICAN BANK", year 2008, at left mintmarks, at right Ag 925, the silver fineness Reverse: a dog, inscriptions "KRASNAIA KNIGA PRIDNESTROVIIA" and "SUCLEYSKAIA DVOROVAYA" (with Cyrillic letters, in Russian) meaning "RED BOOK OF [TRANS]NISTRIA" and "HOME DOG FROM SUCLEIA"
The coins pictures are present on Romanian coins through the kind permission of Ebay seller eargent who had (or maybe still has) this coins for sale. The most important town in Transnistria, id est Tiraspol, was founded in 1792 over an already existing settlement of Moldavian fishermen on the banks of River Nistru, called Sucleia Veche (Old Sucleia, Romanian). 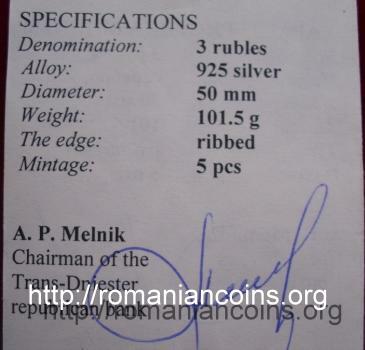 The name of this strain of dog is thus connected to a Transnistrian toponym related to the Moldavian history of Transnistria and of the city of Tiraspol. The issue of such a coin in the Red Book series leads to the deduction that this dog is a local breed, which is in danger of extinction. Although we searched the Internet, we could not find any information about a breed of dog called Sucleia. Certainly it is not a breed approved by the Fédération Internationale Cynologique or by other large association of dog breeders. 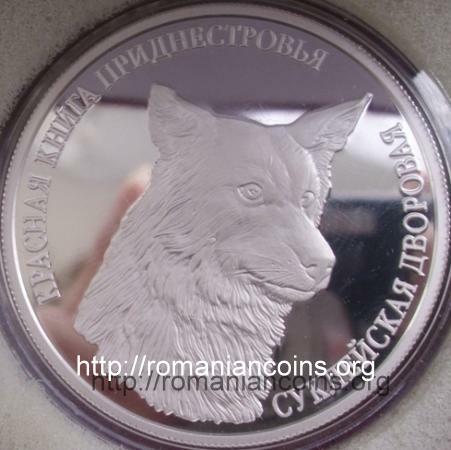 On a Transnistrian forum written in Russian we found the opinion that it should be a joke, in fact the dog watching the villa from Sucleia of an important person in Tiraspol having been represented on the coin.